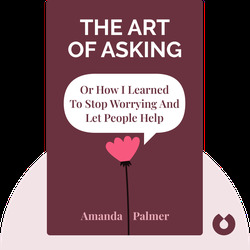 The Art of Asking (2014) is Amanda Palmer’s personal account of how she developed her philosophy of asking, sharing and connecting. Through these blinks you’ll gain an in-depth understanding of how to accept help, reciprocate the generosity of others and build a tight-knit, family-like fanbase to support you in whatever you do. Amanda Palmer is a musician, writer and performer. Starting out as a street performer, Palmer later achieved huge musical success as one part of the duo The Dresden Dolls. Her TED Talk from 2013, “The Art of Asking,” has been viewed more than eight million times.